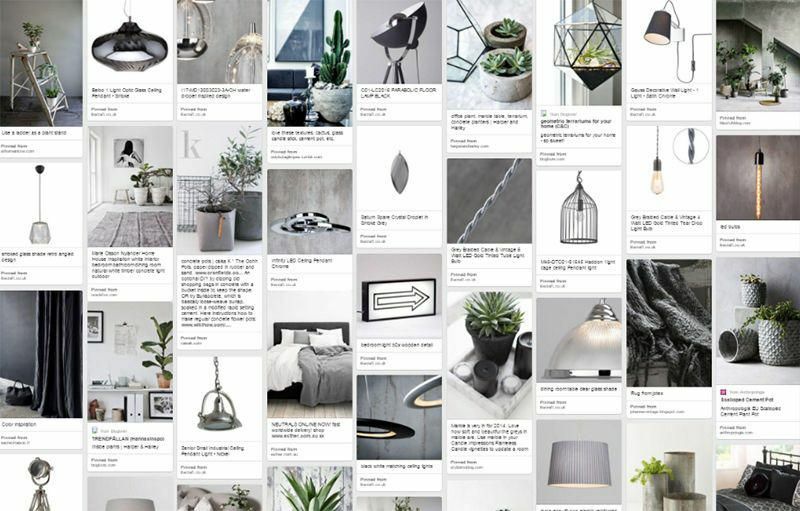 We’re having a serious concrete interior crush at the moment. It just goes with everything; modern, rustic, eclectic… just pick a style and we guarantee that concrete will fit in nicely. When hearing the word concrete, first thing you think of is something raw and industrial. Well, it doesn’t have to be that. Here’s some ideas on how to recreate 3 striking and completely different concrete interior looks. Our Charcoal Green interior look is very minimalistic and almost monochromatic with just a few hints of green foliage. It’s more of an elegant take on the rugged industrial look. Perfect for all you city dwellers unable to imagine life without the bustling everyday energy flowing through the busy roads, yet still needing a tranquil space to unwind after a hectic day. Embrace the minimalist look and give the illusion of space by de-cluttering. Large statement pieces will add a strong focal point to the room while sleek black & white designs will alleviate the roughness of concrete. Our Parabolic floor lamp is perfect for this look. It offers plenty of ambience and style. The masculine, eye catching design will create a striking focal point in any room. When it comes to ceiling lights go for elegant industrial designs. Oversized pendants in polished finishes. Our 1 Light Glass Diner Ceiling Pendant features a sleek chrome frame that surrounds the large ribbed glass shade for defused ambience. Make living in the city’s concrete jungle feel more homely and green by adding cacti and succulents in various sizes. This will finish the minimalist look and make the space look lived-in without making it seem too effeminate. 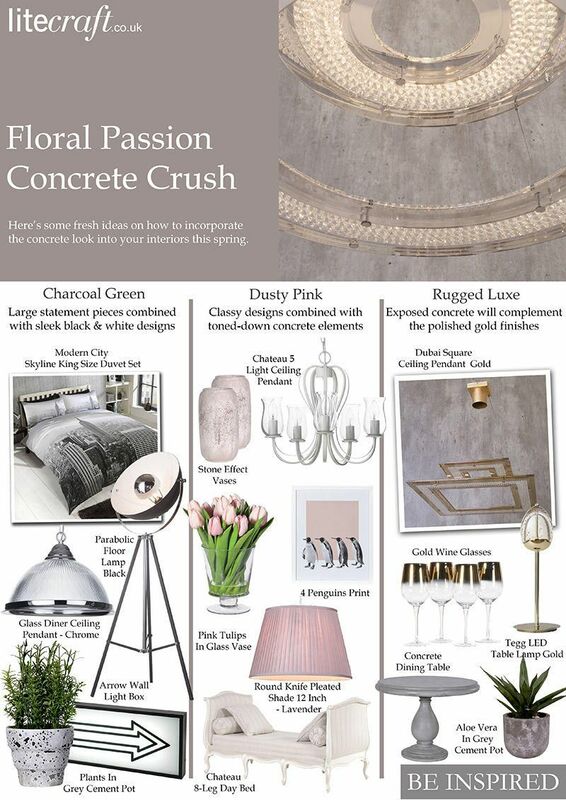 Concrete interior style can feel cosy and feminine. Our Dusty Pink look is based on a fairly subdued colour palette containing mostly whites and greys with touches of soft pinks. Go for classy and elegant designs combined with toned-down concrete elements to create a look of harmoniously subtle elegance. The beauty of this style lies within the details. Add a refined twist to the seemingly cold and weathered concrete look with delicately detailed furniture and accessories. Finished in white satin porcelain effect paint our Chateau 5 light ceiling pays homage to timeless designs. Pair it with French style furniture for a romantic look that will take you back in time. Whether it’s an enormous concrete feature wall or something as subtle as fireplace surround you can easily bring the contrasting styles together by adding some matching decor elements that will complement the clashing styles and create a harmonious look. We have also thought of those of you who appreciate the beauty of roughness yet still crave luxury. Rugged Luxe is all about a tasteful dissonance that brings together old and unrefined with new and polished creating something grand and spectacular. You’ll be surprised how well the stripped back concrete will complement the polished gold finishes. Choose grand ceiling fixtures, such as our Dubai Square ceiling pendant in gold. The breath taking design is a definite show stopper that will look amazing when combined with solid stone interior elements. Boost the luxury look with wall lights or table lamps in matching finishes. Add greenery to make the space look fresh and inviting.